On the 28 March 1930 after 1,599 years, ten months and seventeen days the great city of Constantinople officially became Istanbul. It was on this day that the Turkish Post Office formally changed the name by which it had been informally identified since some time in the 13th century. There has been a town on the site of modern Istanbul since at least the 7th century BC, when it was settled by Greeks. They called it Byzantyium after the perhaps mythical Greek leader Byzas, who captured the land from wild Thracian tribes in 657 BC. When Rome displaced Greece as the predominant power in the area, Byzantium became a free city under Roman overlordship. However by 285 AD the Roman Empire had become so vast that it was no longer feasible to govern all the provinces from the central seat of Rome. The Emperor Diocletian therefore divided the empire into two halves with the Eastern Empire governed out of Byzantium and the Western Empire governed from Rome. By 285 AD the Roman Empire was so vast that it was no longer feasible to govern all the provinces from Rome so Emperor Diocletian divided the empire into two halves : the Eastern Empire governed from Byzantium and the Western Empire from Rome. Both sections were known equally as `The Roman Empire’ although, in time, the Eastern Empire would adopt Greek instead of Latin and would lose much of the character of the traditional Roman Empire. Division inevitably lead to tensions and conflicts especially when rival claimants attempted to rule the Western half. he saw the guardian deity of the city, an old crone, forlorn and failing from age and infirmities. Suddenly she was transformed into a radiant young woman, and in his dream he placed a diadem on her head. 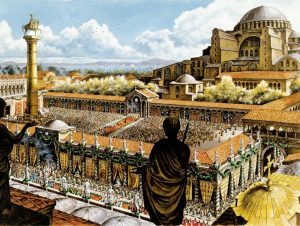 Constantine immediately undertook a huge building programme, tripling the size of the city, and on 11 May 330 dedicated it as Constantinople (Constantinopolis), replacing Rome as capital of the empire. on 11 May 330 (he) dedicated it as Constantinople (Constantinopolis), replacing Rome as capital of the empire. Constantinople became the greatest city in the civilised world, but over the centuries it had to weather many storms, including a 6th-century plague that killed most of the inhabitants. It was attacked innumerable times, but thanks to its huge 5th-century walls, it remained unconquerable. By the 13th century, Anatolian Turks were already referring to Constantinople as Istinpolin, derived from the Greek phrase eisten polin meaning ‘in the city’. But even after the Turks finally conquered it in 1453 it remained Constantinople to all but some of its own inhabitants. Over the years the Turks increasingly called it Istanbul, as scarcely a reminder in the city of its Greek or Roman past remained. By the time of the official name change, no trace of Byzantium was left, and the only remnant of the Great Constantine was the eponymous burnt porphyry column that still draws the gazes of tourists in Old Istanbul.